BS/EN 14122-3 (mobile and working towers made from pre fab elements) BS/EN 1004 (safety of machinery – permanent means of access to machinery)guidelines. Manufactured to Acres drawing number 2011-03-8193. The platforms are required to access flour mill sifter machine equipment. The platforms are manufactured from 40mm, 30mm and 25mm light-weight ERW box section and assembled with 4 off 100mm castors, two off fixed, two off swivel with brakes. The assembly is fitted with a 4.5mm over pattern treadplate and safety chains. The access steps hinge up and can be fixed into position. 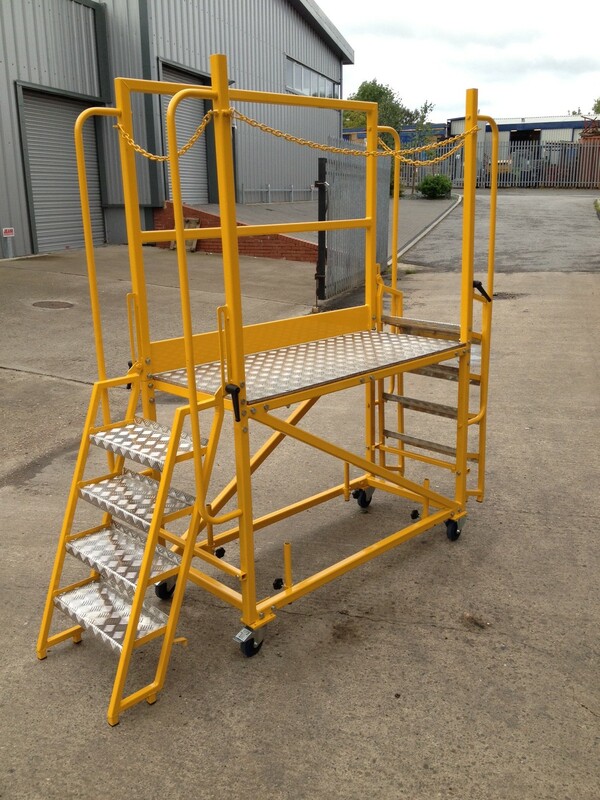 The access platforms have two sets of steps allowing easier access to the sifter. The steps are fitted with gas struts. Due to the explosive nature of the environment Acres supplied the platforms in ‘flat pack’ style and the parts were hand carried up to the Sifter floor and assembled using hand tools only.